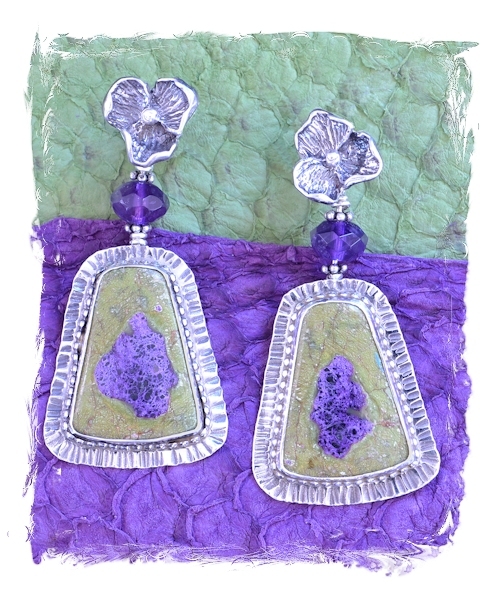 Pretty little purple and green earrings made from natural stones, can you believe it?. The purple Stichtite is a chromium magnesium carbonate, discovered in 1910 in Tasmania. Wiki says it occurs with green Serpentine at Stichtite Hill, Tasmania. I don't usually mix faceted stones with cabochons, they most often argue with one another. However in this case, I thought they worked together very nicely. Perhaps the reason is partly metaphysical: Ahsian notes that the combination of Serpentine and Stichtite is "a powerful tool for opening to Spirit." And Simmons discusses Amethyst as providing spiritual protection. If they are correct, it's no wonder the earrings needed both stones. Judy Hall mentions Stichtite for a number of conditions, e.g., for ADHD. Golnaz Alibagi has a most interesting way of categorizing crystals (e.g., a section on "overcoming ageism") and he praises Stichtite for many things. He includes this marvelous statement, "Hold a Stichtite to prevent you from walking into the same puddles time and time again." Don't we all need a little help with that? When I'm wandering around on Amazon looking for books related to the jewelry, I often run into fascinating old books which thankfully are being re-published now. That's why Oscar De Satgé's 1901 volume is included below. It doesn't mention Stichtite (which hadn't even been discovered yet) though there are discussions of the minerals of Tasmania, and it offers a description of an unusual life in an exotic locale from a time not that long past but so very different from our own. 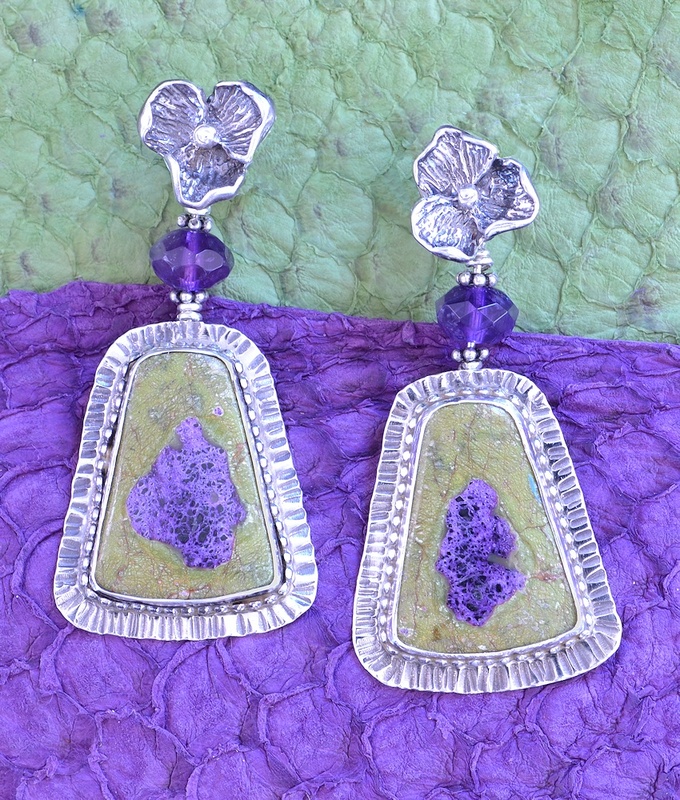 Won't you order these lovely earrings with their fascinating stones today?